“Is there a special place in hell for people who appropriate their own culture?” So asks Raj in Dipika Guha’s The Yoga Play, which recently opened at San Francisco Playhouse. The line gets a laugh, as did many lines in this hilarious look at how and why Americans misappropriate other cultures in our voracious curiosity to inhabit the world in all its wild and beautiful diversity. The play opens with Joan (Susi Damilano) talking out at the audience while behind her is the enormous projected face of John Dale. The bearded Dale (Craig Marker) is a spaced-out enthusiast and corporate maven who has made a fortune in the world of yoga apparel. His label Jojomon has taken a few hits recently, and Joan is out to resuscitate the brand. As she reels out heaps of stats and stock market figures, Dale, sitting on an unspecified porch in some unidentified sub-tropical paradise, is distracted by his dog: “No! Down! Who’s a good girl?” We’re not quite sure who he’s talking to – the dog or his staff. 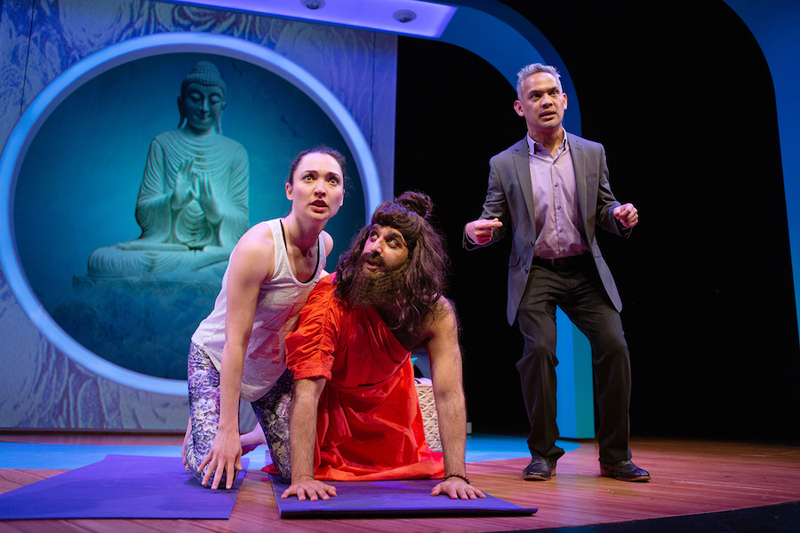 Romola (Ayelet Firstenberg) tries to teach Gururaj (Bobak Cyrus Bakhtiari) yoga with the help of Fred (Ryan Morales) in San Francisco Playhouse’s production of Dipika Guga’s “The Yoga Play”. Photo by Jessica Palopoli. Raj (Bobak Cyrus Bakhtiari) and Fred (Ryan Morales) sit at a table behind Joan like two pillars of corporate non-entity, waiting to spring up at any indication of interest to reveal the newest Jojomon product: Slow-Release Lavender-Infused Yoga Pants. Joan also wants to convince Daly to include women’s size 12 in their inventory. Daly is baffled. “Will one of you tell him size 12 is not a plus size?” Joan asks her colleagues. Nope. The boys don’t contradict the Boss. But then she gives Dale the most convincing argument, and it’s in the form of millions of dollars of profit, or was it billions? He is persuaded. And off to play with his dog. Things are going swimmingly until the BBC Investigative Reporting team releases their research into Lotus Ltd, the Bangladesh company that actually makes the clothes for Jojomon. Joan and her team haven’t done their research quite well enough, it appears, and the scandal that Lotus Ltd jobs out their manufacturing to sweatshops that employ 11-year-old girls looks likely to bring the company down. Sharing their dreams and holding hands while breathing don’t seem to be effective in diminishing the burden now descended on Joan, Raj and Fred. What to do? What to do? Joan needs this success. She has struggled – and failed – as a woman in corporate business. It’s a battle to the death for her self-esteem. Fred needs this success because he needs the job for a green card. As he explains, you don’t know what it’s like to be gay and live in Singapore. Raj too struggles to find his identity as a South Asian raised in the US. It’s Joan who comes up with an idea that, if it works, will be a solution for them all. What the company’s clientele (and clientele are always referred to as “family”) is feeling is not anger about the exploitation of children, but guilt. It’s a crisis of authenticity, not ethics. And what’s needed is to take the company back to its roots, to find the mystical authenticity that was the source of the company’s initial success. Fortunately, John Dale is incommunicado for two weeks while his online service is being revived. And that gives Joan, Raj and Fred just enough time. “Find me a guru!” says Joan. “Where?” asks Fred. “LA,” answers Joan. And so they set off to find a Real Guru, which leads them from LA to Haidaram, India, and to surprising and riotously funny results. No spoilers here. Best to take a night off to enjoy this wonderfully savvy play, under the nimble direction of Bill English, in one of San Francisco’s most charming venues. Dipika Guha’s The Yoga Play continues through April 20. For information and tickets, visit sfplayhouse.org.